One of my quilty resolutions this year is to make a scrappy quilt a month, or 12 scrap quilts this year. This is a huge resolution, I know, but I have a lot of scraps to use up. 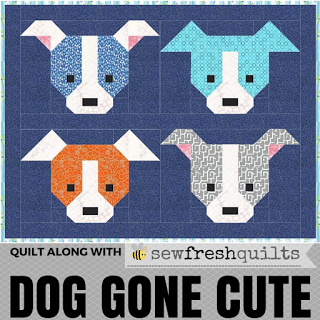 And really scrap quilts are my favorite! Well, Angela's Rainbow Scrap Challenge is perfect for this. She picks a color every month for us to focus on. January's color is blue. I had 4 different scrap quilts floating around in my head that were just perfect for this challenge. Focusing on just one color a month means that I am just doing a few blocks a month and by the end of the year I will have 4 whole quilts ready to put together. Perfect! Some scrappy log cabins. I've made a quilt like this before and just LOVE it. Since, I always have scraps of 2 1/2 inch strips, this may just be a quilt I make every year. These bamboo looking blocks have been on my to-do list for a LONG time, ever since I saw Amanda's version over at Crazy Mom Quilts. This is a perfect way to use up those tiny little crumbs. Wonky Stars using "made-fabric". I can't throw ANYTHING away. Sometimes when I just need some mindless sewing, I sit and sew tiny little scraps together and make slabs of fabric that I can then cut up and use however I want. These stars just show off all that fun scrappiness. And finally, these flying geese from The Best of Quilty. They have been calling my name. I am excited to be able to spend a little time with these blocks each month. What color will February bring? I love your blocks, especially the bamboo type ones. I can't wait until the end of the year to see all the quilts. Love those flying geese blocks! The color fade looks great. Oh my, I love them all! Especially the flying geese. I have made many quilts using 2.5" squares -- the geese add a lot. I must try this. Love the colors and fabrics - looking really good! Wow, you are well on your way to 12 scrappy quilts for the year. What an impressive goal! Love them all, particularly the last one and the log cabin. Have fun. These are lovely - you would never know they were 'just from scraps' because they are beautiful. Those crumb birch trees are also on my list since seeing them on CMQ ....... now they are calling louder! Thanks for sharing all your wonderful projects, I like the bamboo one and the flying geese. Love the idea of sewing tiny scraps together for another day and those bamboo blocks are going on my list! All your blocks are lovely! Great use of scraps! The blue theme is really nice. Your scrappy choices worked well!